Following a review of my Custom CE-N acoustic for Guitarist's Dave Burrluck, I received an enquiry about building a steel strung "acoustic" with Variax 700 acoustic electronics. I was interested, as I hadn't't had much experience with Line 6s' acoustics. The request soon 'morphed' into a solid 'acoustic' with the Fishman Aura Pro system, which I had fitted to Dave's guitar. This interested me more, coming straight after Dave's. As it turned out, Nick (customer) hadn't seen the Guitarist article and it was pure coincidence. Anyway the spec was an acoustic looking instrument but built with a hollow chambered body, to eliminate feedback, relying solely on the Aura system for the acoustic sounds and a magnetic pickup in the neck position for other jazzy sounds. The shape chosen was the same in profile as the CE-N but only 2" deep. Nick plays a nylon string classical guitar mainly, so this one was to have the same neck profile, twelve fret to body and be as light as possible in weight. Rubner supplied the tuners, with barrels suited to steel strings and very classy they looked, with ebony buttons and gold base plates. 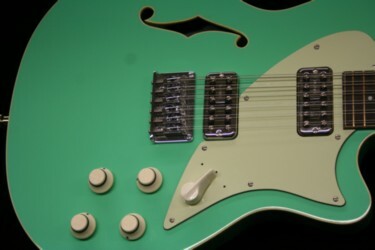 We chose a Seymour Duncan 'Benadetto' pickup, which could be coil split and output was via a stereo socket. 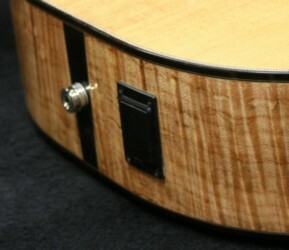 The "Benadetto" pickup also blended in nicely with the fingerboard, as it had a 'woody' finish. The mahogany body was carefully chambered, leaving supports under the bridge area and strengthening spars across the upper and lower bouts. 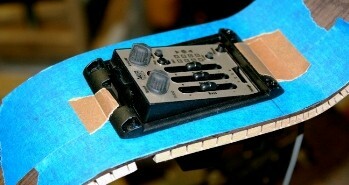 The controls were to be kept simple, leaving the front of the guitar uncluttered. The Aura system has its own buttons and sliders (if your eye sight is up to it!!) and the magnetic pickup, one tone with push/push for coil splitting and a volume control. 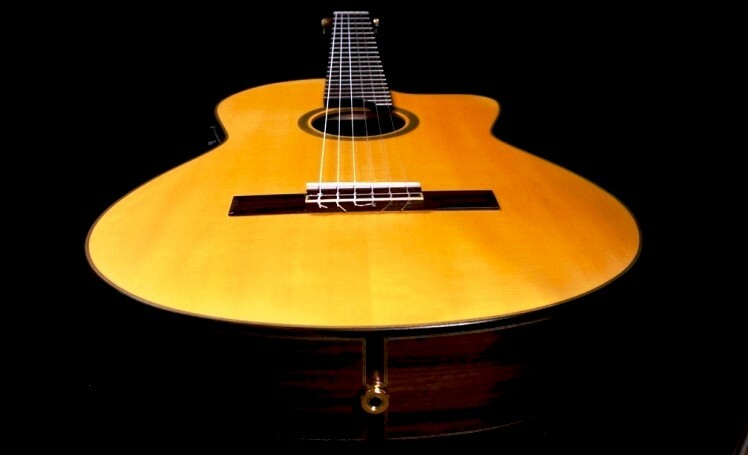 I used a similar slotted headstock to the CE-N, having tried a more 'parlour slotted shape, which didn't work because of the classical width top nut, and a macassar ebony acoustic bridge but with 'body through stringing' like a tele, as I didn't want any broken string ball ends rattling around inside the body. Actually I was very pleased how this turned out aesthetically. The neck was spliced, reinforced mahogany with a two way rod. 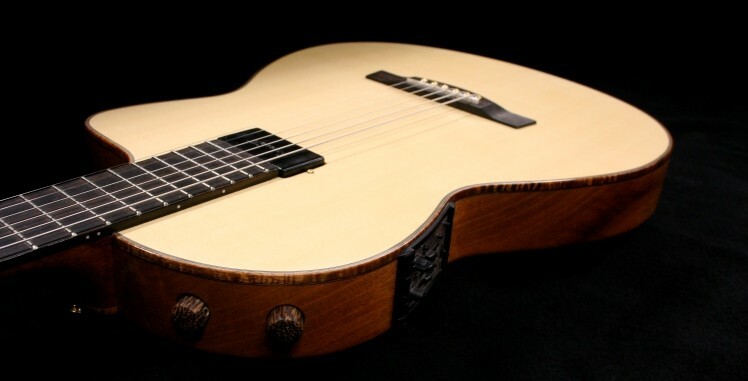 The macassar ebony fingerboard had side markings only. The Benadetto pickup controls were turned wood and recessed as far as possible into the upper rim of the body. So my experience with Fishman's finest has impressed me and building something quite different has kept me on my toes. Nylon strung cutaway Electro Acoustic Nov 2012 This is a slightly odd one as most of the info on this guitar can be found in "Guitarist' mag April 2013. 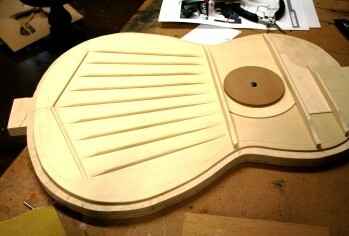 I had built a couple of guitars for Dave Burrluck, Guitarist magazines reviews editor previously. Both were Variax equipped electric guitars. I have bought the mag. for donkeys years and still do and read almost all of it. I came across a longterm test of a Godin nylon electro by Dave and he was not entirely satisfied with it, so, with my usual big headedness, I offered to build something that might possibly be more suitable. I based my shape on Dave's Alvarez but added a slightly Selmer Maccaferri cutaway and a rosette and purflings in the same style. I'd learned that Dave hates 'bling' so no fingerboard/headstock bindings, no inlays, no logo etc etc. The woods chosen were straight forward - an Engleman spruce top with rosewood back and sides, ebony fingerboard (flat/wide), rosewood bridge and cedar neck - all very traditional. I have a good friend, Earl Marsh, who makes superb classical and flamenco guitars and we often bore everyone with our incessant talk about everything guitar, and so who better to go to to ask for advice. I was pointed in the direction of a strutting pattern based on the guitars by Ignacio Fleta. We wanted a robust set up to minimise feedback but still wanted a 'spanish' sound. The rest of the build followed normally and the body modified and reinforced to take the Fishman set up (PIC FB2B). I did strengthen the cedar neck with two carbon fibre bars (no truss rod) and the neck was dovetailed to the body, much in the Fleta way. 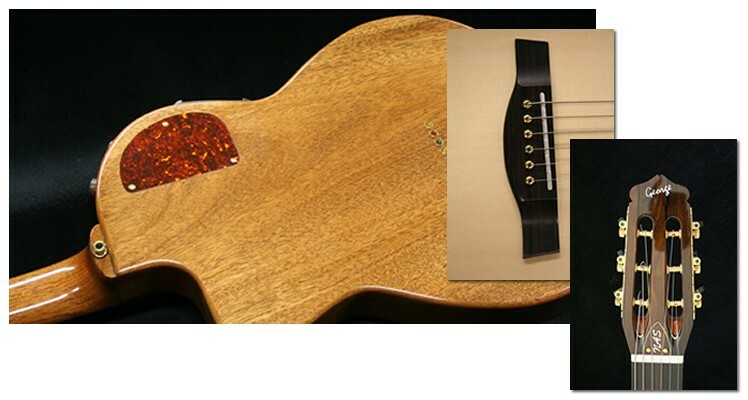 The finish was hand rubbed nitro cellulose to the back, sides and neck, gun finish satin to the top and gloss to the rosewood headfacing and rosewood bridge. With the guitar strung up and fettled I took it along to Earl and the man from Delmonte (well Boston actually) said 'Yes'!! Dave came to pick it up and to download some of the Fishman Aura Images - a very simple operation, as long as your computer is up to spec (mine isn't). Dave and I visited Earl and played some of his guitars and I was amazed how different they all were. I could only hear the subtle differences when the guitars were played back to back but differences there were. So back at my place, we played more with the different images and tried to capture a couple of 'perfect' sounds that Dave needed for his various gigs styles. The guitar has been featured in three long term tests in Guitarist so I won't go into more detail here save to quote, "It is the most in-tune nylon I own and works superbly in a live environment. For my band gigs, however, I still take out my trusty Yamaha NCX2000; it's like an old friend, it isn't better or worse then the CE-N, the sound just suits the gig". So have I succeeded? I am not sure. Perhaps the Fishman needs a bit of 'deep editing' which apparently can be done, but I'm more than pleased with it, and I know Dave loves it, and I have learned a great deal from the build. Interestingly, I'm just finishing a steel string with Aura and mag pickup but with a hollow solid body, one to watch?